Starting October 7, the TTC will make changes to streetcar service on King Street. The 514 Cherry will be discontinued, and its service area will be covered by two overlapping branches of the 504 King. 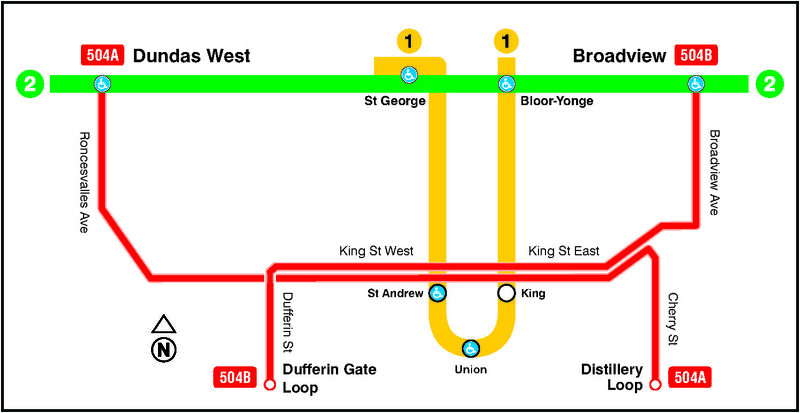 From the west, the 504A King will run from Dundas West Station via King to Cherry Street. From the east, the 504B King will run from Broadview Station via King to Dufferin Street. Please click here for map. You can also click here visit the TTC website for more information. By changing the service in this way, the impacts of any disruptions at the ends of the routes should be reduced. It will also have the effect of increasing frequency and capacity on King Street between Dufferin and Cherry, where ridership is highest today. This move builds on the improvements to travel time and reliability already achieved by the King Street Pilot. The city is still waiting on the delivery of a number of new low-floor streetcars from Bombardier, so rush hour service will be supplemented by some older streetcars. Outside of rush hours, both branches are planned to be fully accessible, served by new streetcars only.